We spent over 20 hours researching and testing 15 different types of stud sensors and found that accuracy, battery type, and warranty were most important. The Black and Decker auto leveling stud sensor scored high marks in all categories and is our top pick. This stud sensor offers two tools in one since you also get an auto leveling laser level as well as the stud sensor. 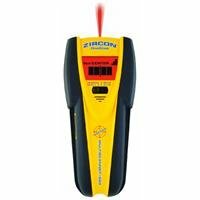 It was easy to read on the LCD display and is compact and easy to carry around in the tool belt, box or bag. It comes with a 2 year warranty. Most people falsely assume that a stud sensor isn’t a necessary investment for your tool box, but if you’re a professional carpenter then you know this can’t be further from the truth. Stud sensors help you to find the studs that lye within your walls, so that when you’re nailing and drilling you won’t hit anything that you don’t want to. Many professionals know how to find these studs without a tool, but for DIY-ers you need a piece of equipment to help you to accomplish this task. The following top rated stud sensors are the ones that not only professionals, but also homeowners, swear by. They’re made from durable materials and give accurate readings that you can count on. 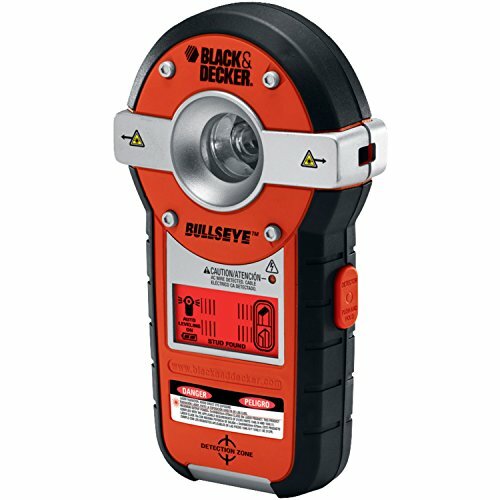 This stud sensor from Black & Decker features BullsEye Auto-Leveling interior line laser technology, and that is what helps to make it one of the top picks on the market. This sensor is used for both test and measurement of levels, and is manufactured in China. The sensor really is two tools in one, both an auto leveling laser level and stud sensor, so you’re getting a versatile product that is helping you to perform more tasks than other sensors. The sensor also detects wood, metal, studs, and live A/C wires. The patented auto-leveling technology is some of the best you’re going to find, and it comes with an easy to read LCD display as well. The product is backed by a 2 year limited warranty that ensures that it’s going to stand the test of time. All in all, this is a top rated sensor because it performs at the highest possible level and comes in a compact size that is easy to take on the go. This stud sensor from Zircon is a MultiScanner center-finding device with metal and AC electrical scanning. The item is designed to locate the edges of and center of wood or metal studs that are up to 1.5 inches deep. It can also scan metal and live AC wires. The sensor features an easy to read LCD display, auto tone, and patented SpotLite pointing system that indicates the stud’s center. Also, with WireWarning detection you can tell the presence of live, unshielded electrical wiring that is up to 2” deep. A top rated sensor, this item is easy to carry on the go thanks to its portable size. Also, the smart design ensures that it’s going to stand the test of time. Customers love this stud sensor because it performs with the best of them, and comes at a price that customers can afford. This high quality stud sensor easily locates the edges of wood and metal studs that are up to 3/4 inch deep, and the DeepScan mode will double the scanning depth to 1.5 inches. You get WireWarning detection that will indicate the presence of live wire that is up to 2” deep. Thanks to the easy to read LCD display, you can quickly tell when the stud edge is approached. With the updated spotLite pointer technology, you find a handy arrow that shines a light on the wall to mark the target. This is a top rated product because it’s constructed from materials that are sure to stand the test of time, and the quality is so high that it can easily be used by professionals and non professionals alike. When you’re ready to get the very best in stud sensing then you can’t go wrong with this product from Zircon. These top rated stud sensors are durably constructed and easy to use. They also come at a price that most consumers can afford. When you’re ready to buy a great sensor, then choosing one of these three is a smart decision, because they universally get good reviews and are constructed from durable materials. Should one of these not specifically suit your needs, the following buyer’s guide will help you to continue your search so that you can find something that is just right for you. There are numerous kinds of sensors out there, so you need to begin by understanding what kind of job you’re going to be working on. What is a Stud Sensor? When you’re tackling a home DIY project, the stud finder tool is going to help you to perform a number of tasks, and it’s a great addition to any home tool kit. This tool is not only handy and versatile, it’s also essential when it comes to projects that involve drilling, screwing, or hammering into the walls. When you’re an experienced carpenter, you know how to use your knuckles to locate a stud, and knocking on the wall will create a different sound when there is a stud present. But some of us aren’t professionals, and we need a tool to help us locate these things. In this guide we’ll talk about the key features of a stud sensor, so that you can make an informed purchase. If you’re hanging or securing anything on the wall, you need to keep in mind it’s important to avoid any studs or framing elements that might be beneath. Locating studs is not always an easy task, and that’s why a piece of equipment might be necessary to get the job done. You’ll see that stud sensors come in many different styles and types, and it’s important to know the difference before you make a purchase. You also need to know which kind of finder works best for a given project. Here are the key features that you need to look out for on a stud sensor. There are two types of stud finders, and each has its own benefits and problems. You’re going to need to choose between magnetic models, and those that contain an internal capacitor. The difference is really going to come down to personal preference, but there will be factors at play such as type of wall you’re working with, budget for tools, and ease of access. Stationary Magnetic: There are two types of magnets that you’ll find in magnetic stud sensors, and these are either stationary or moving. With a stationary magnet, you get just what the name suggests. This is a magnet that is not moving, and used to detect the stud under the surface of the wall. When you pass over a stud or screw, you’ll feel a pull or force as the magnet is detecting it. This is very useful when you’re using equipment on drywall, because the screws and studs are going to be quite close to the surface, and this makes them easier to detect. But, on plaster walls the screws are going to be buried much more deeply, almost half an inch, and that means that a stationary magnet isn’t going to be strong enough to find them. Moving Magnet: To get even better range, you’re going to need to get a neodymium magnet which is free to move. This is a rare earth metal that is an extremely strong magnet that has the ability to freely move within the housing of the stud sensor, and this makes it capable of detecting studs through practically any surface. This magnet is going to move at a speed that is relative to the depth of the metal, and that means that with a drywall stud you’re going to get a deep thud, and with a plaster wall you’re going to get a softer sound. Internal Capacitor: This second type of stud sensor uses a plate that detects changes in electromagnetic composition of the wall. This change in density will mean the framing stud has been located. This is the most common type of stud finder that you’re going to find, and there are three different sub types. Edge Finders: The edge finder detects the changes in wall density that is often indicating the edge of a framing stud. This is the most inexpensive model that you can buy. Center Finders: This device has multiple sensors to detect the various changes in the electromagnetic flux. That allows you to pinpoint the center of a stud in the wall. Instant Finders: This kind of finder has multiple sensor plates with multiple sensors that can be placed completely across the wall. This is used to not only find the center of the stud, but also the location of various different studs at the same time. When you’re ready to purchase a stud finder, there are certain things that must be considered to make an informed decision. Here are the areas that you need to look at to ask yourself some key questions. Cost: When you’re doing a DIY project, you always need to factor in the cost of your tools. The price for a stud sensor can vary dependent upon the brand, condition, construction, and complexity of the device. You want to have a budget in mind, because this will narrow down your research and give you various options within your price range. Condition: It’s possible to find a stud sensor that is either new or used, and the condition will vary among these. It comes down to the preferences of the individual, but the condition of the product will effect the price. Brand: There are many different manufacturers of stud sensors, and again this will largely come down to personal preference, and it will also affect the cost. Some major brands include Stanley, Zircon, and Bosch. Purpose: You always want to keep in mind how your stud sensor is going to be used. If you’re using this device professionally then you want to definitely invest in something that is going to perform the given task, but if you’re a casual DIY worker, then you may not need to spend so much. Buying a Stud Sensor Online: There are a number of places online where you can purchase a stud sensor, and it really comes down to where you feel most comfortable doing your shopping. It’s possible to get one on eBay, or any online retailer that sells the top brands at discount prices. Amazon is always a great website to make this kind of purchase, and the top rated stud sensors are sold there. New Innovations: Technology is always getting better each and every day, and the same goes for stud sensors. If you want the latest and greatest, then it’s best to look for the most updated device possible. Each year new stud sensors come out on the market, so read reviews for these and see what level of customer satisfaction they have. You can use stud finders in so many different ways, and there are a number of different options that you have when it comes to purchasing one. You always want to make sure that the device that you get works with the requirements of your specific job. This is the most important consideration and something that some workers take for granted. There are numerous different sites online where you can find this tool, but it’s always advised that you go into a retail store as well so that you can work with the tool that you’re considering buying. You want to make sure that it’s lightweight enough to carry on the go and comfortable to hold in your hand. Although most stud finders aren’t too expensive, you’re going to find that the ones that are expensive are intended for professional use and will be made from the highest quality materials. It’s always smart to look for a sensor that is backed by a warranty, as this will ensure that it’s going to stand the test of time. A stud sensor is a must-have tool if you do projects at home that require nailing into walls. You need to sense where the studs are under the walls so that you don’t hit anything that you don’t want to hit. A high quality stud sensor, like one of the top rated ones mentioned above, will help you to find studs so that you can successfully do a number of carpentry tasks with. The top rated sensors are the ones that customers universally praise, for their durability and high performance. These are an excellent choice when you want to get the job done with a tool that you can count on. There are numerous different kinds of stud sensors, as we discussed in our buyer’s guide, and all of these are going to work well for various different tasks. Finding the right sensor for you is about knowing what kind of job you’ll be working on, so that you can find the sensor that is going to fulfill your needs. What Does RSVP Mean in an Invitation Card?